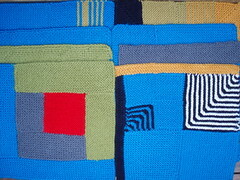 I've finished my two blue gift scarves. They've been given away and accepted with kind comments from their recipients. It gives me great pleasure to hand-make gifts for others. The scarf's probably a little shorter than I would have liked, but I ran out of time to make it longer. Nevertheless, it's long enough to tie well in several different ways, and it falls beautifully. It was my first time to block 'properly', with blocking wires. I love the neatness and regularity of the blocked pattern, with each stitch clearly defined. The second scarf was given to my son on his Sunday birthday. I may also have chosen to make it longer if I'd had more time, but as it happens it's the perfect length to tie and tuck into his jacket when he rides his motor-bike. This is a simple scarf in broken rib. Somewhat repetitious to knit, but as always I was captured by a stitch pattern that has an elegant simplicity. 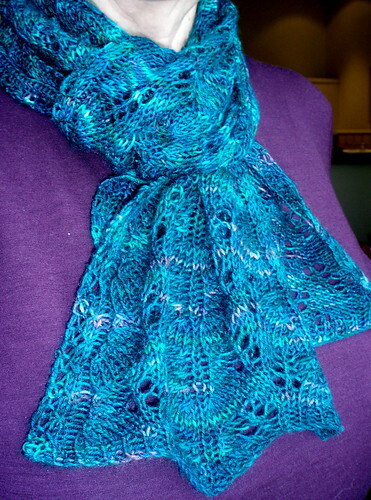 The finished scarf is warm, soft, but quite assertive. My son likes it and has already used it. I couldn't work out what the purpose of the cherry-picker was...though it wasn't actually doing anything this morning, as it was too wet. Possibly cleaning out or in some way repairing the old watertower you can see in the left of this photo. 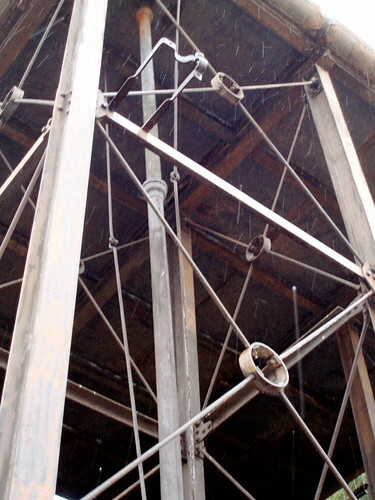 The watertower is a reminder of the times when steam trains were built and tested in this area. I love the watertower and my view of it. I love the rusted texture of its surfaces, and I particularly love the geometry of its supporting structure. 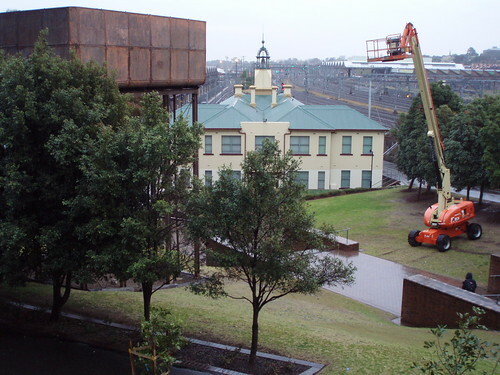 My view is over the old Eveleigh* Railway Workshops (now the Australian Technology Park) and along the western stretch of the city railway line. I'm not sure if it qualifies as a 'view' as described by real estate agents - it's certainly not beautiful in any conventional way. But I enjoy its expansiveness and its busy-ness, and take pleasure because it is so much a part of Sydney and its history and development. The (now) Australian Technology Park has some remarkably intact examples of late nineteenth century industrial architecture, and some of the more dramatic large pieces of machinery from the train building era have been retained and preserved. 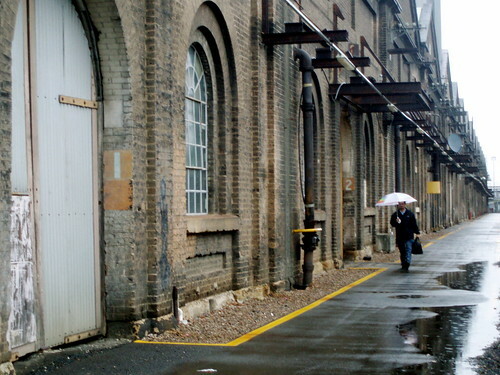 Parts of the space can look moody and gritty - particularly on rainy mornings like today - and from time to time it is used as a location for noirish films or TV series. In the more than twenty years I've lived here there have been many changes. My living room view used to be of the tumbledown sheds of the railway locksmiths' workshop, without a single tree in sight. In recent years, lots of trees have been planted and paths laid, and spaces cleared so you can see the beauty of the shapes of the buildings. It's become a pleasant place for walks and lingering on summer evenings (or taking photos on rainy winter mornings). * Spelling slips between Eveleigh and Everleigh. Not sure which is correct. I'm reading the latest in Peter Robinson's Inspector Banks series - All the Colours of Darkness. 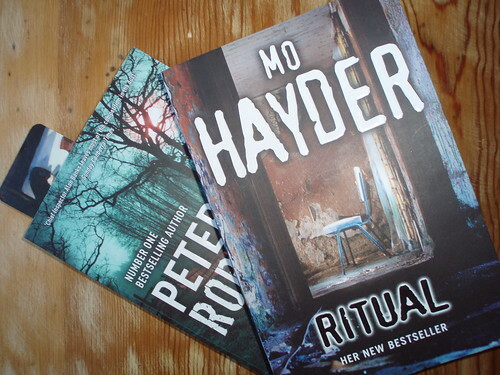 I've just finished Mo Hayder's Ritual. Of the last five books I've read, three have been crime fiction. And, I rather shamefacedly admit, this is not an unusual state of affairs. It's an interesting phenomenon, this modern omnipresence of crime fiction, with all sorts of explanations for its popularity among respectable, mainly law-abiding readers. Most common is the theory that, as for Shakespearean comedy, the certainty of the eventual triumph of good - of resolution - allows readers to enjoy all sorts transgressions and evil, safe in the knowledge that order will be restored by the end of the play or the book. I'm not sure that this theory still holds good, as some of the more recent crime fiction writers, Mo Hayder for example, depict a word in which deep evil exists, and where some criminals go undetected and unpunished. My favorite category of crime fiction has at its centre the world-weary, slightly alienated loner investigator, who quietly despairs at the state of the world around them - Henning Mankell's Kurt Wallender, Ian Rankin's Rebus and Sara Paretsky's V.I. Warshawski. Peter Robinson's Banks also falls into this category, but he doesn't quite have the depth of characterisation of my favorites. I guess these characters demonstrate a world-weariness that I fantasise I'd like to share. Despite the theories, I think I know why I read crime fiction. I've always needed to read to 'escape'; reading simply for pleasure, rather than for self-improvement or illumination. I take great pleasure from strong narratives and characters I can care for. Before I discovered crime fiction I read vast quantities of nineteenth century fiction (and still do, when I find something I've not read) and I think I liked it for the same reasons I like crime fiction. Few things are more comforting and diverting than escaping into a Trollope novel, or immersing yourself in Margaret Oliphant's village life. Still, even though my motives for reading them are similar, most people would probably be much more impressed by a sidebar of nineteenth century fiction than they are by my current reading list! I'm knitting two blue scarves. Two deep blue scarves. Two deep blue scarves with deadlines for finishing that are less than two weeks away. I'd been wondering what to buy as a farewell gift for my good friend and work colleague of many years who's going off to London. I needed nothing too heavy or cumbersome as she's transferring her whole family, and I wanted something that would remind her how well I think of her. So I'm knitting a simple but elegant lace pattern called Haruha from some hand-dyed Patonyl I received as part of a swap from Sonia. 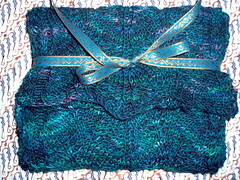 The deep blue / mauve / green colour is perfect for my red-haired friend, and the scarf will be ideal for a London autumn. The scarf's a bit less than half done, and I have to finish it in two weeks time. 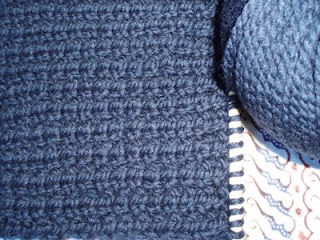 The second scarf is a gift for my motor-cycle riding son's birthday. I'd previously purposely decided not to make a scarf as a birthday gift for him because I'd thought that by late August it would be too warm to make it a useful or welcome gift. 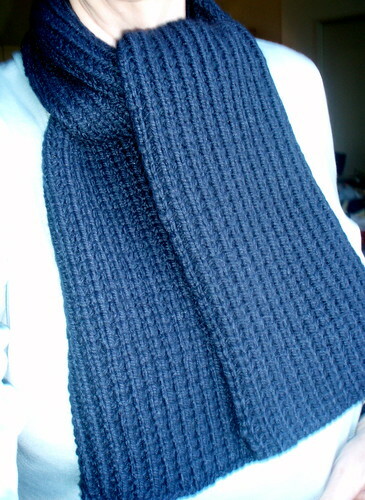 But it's been so unseasonably cold for Sydney that yesterday I decided that making a birthday scarf was unavoidable. I bought some Jo Sharp Silkroad Aran in a deep true navy from Tapestry Craft (after a visit to the dentist, so buying yarn seemed a suitable compensation) and I'm knitting a scarf in broken rib, modeled on the Men's Cashmere Scarf from Joelle Hoverson's Last Minute Knitted Gifts. The deadline for this scarf is only 10 days away. One of the good things about scarves is that - within reason- you can finish them whenever you run out of time, and if necessary pretend that what you've done is meant to be a neat 'tuck-in' scarf, rather than one meant for swishing. I'll post the outcomes when I reach them - suspense! Yesterday I went to the opening of an exhibition, Thalassa, by my friend and neighbour Marea Gazzard. Marea has an international reputation as an artist, originally as a ceramicist, and increasingly as a sculptor. Marea has had a long career, sustaining her beautiful, spare, ageless shapes - reminiscent sometimes of the primeval forms of the Australian landscapes, often reflecting the ancient traditions of Greece, one of the lands of her heritage, and from time to time capturing the elemental shapes of faces and visages. The forms of this latest work are still recognisably Marea's, but they have a lightness and glowing green-blue colour that is new. I find it so admirable that she is still envisaging the world in new ways - imagining new shapes, patinas, and colours. The work is very beautiful and beautifully displayed with lots of airy space to set off the simple forms. From time to time and in among other projects I've been knitting garter stitch squares for Wrap With Love, an Australian charity that solicits squares to be sewn into blankets and distributed as needed for crises, either within Australia or internationally. This has been great fun; simple knitting, quickly accomplished, where you can experiment with colour and shapes within the confines of a 25 x 25cm garter stitch square. 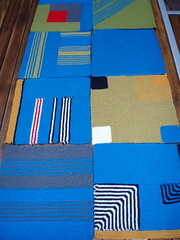 I've completed the 8 squares I set myself as a target, and have enjoyed the process so much that I've decided I'd now like to make a small blanket for the dotee, my grand-daughter. I'm indebted to the Mason-Dixon blog for some of these shapes and combinations, though garter stitch squares are so generic and timeless that they're almost beyond ownership. 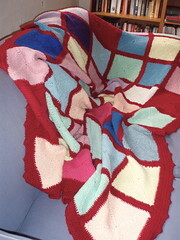 My workplace has had a lunchtime group to knit squares for ‘Wrap With Love’. Each year the drive for squares culminates with a massive ‘Knit In’ at the local public radio station ABC702, which was held in the morning on Friday 1 August. A group of us went from work, just across the road to the ABC foyer, where around 500 knitters of all ages had assembled to knit, sew up squares or submit their finished blankets. but what was so impressive was the diversity of the groups. We found ourselves among a group of older Chinese women who had knitted the most beautiful blankets, with complex edges and appliqued knitted motifs. 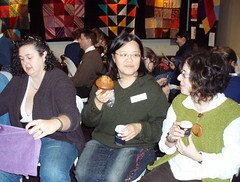 I was fascinated by the speed of their knitting and a mysterious (to me) deft three-needle method for casting on. Their justified pride and delight in their work overcame all language barriers. My mother knitted and crocheted this blanket for me for my fiftieth birthday. 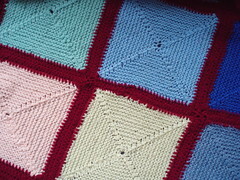 It has knitted squares (knitted from the centre out) with crocheted edges to each square and a crocheted border. I suspect it was one of the last projects she made, as towards the end of her life she had a stroke-like condition that limited her fine motor skills. These are not colours I would choose for myself, nor do they particularly match the colours of my rooms, but until a couple of years ago the blanket was happily used as our main 'couch' blanket in the living room - burrowed into in winter by whoever felt the need to curl up on the couch. After some time I put it aside to mend the seams that were parting and to darn the single square that mysteriously seemed to have been attacked by moths and, like so much mending, it lingered...and lingered...in the mending pile. 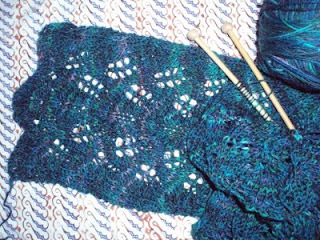 I've recently, finally, mended it, and in doing so have had another flood of memories of my mother and her knitting and my relationship with her. And a nostalgic note about the couch in the first picture - it is part of a 'lounge suite', dating from a time when I had never heard the word 'couch'. My parents bought the seductively comfortable and bulky three-seater 'lounge' and two chairs, already second hand, when they were setting up house in 1947, after my father had returned from the second world war. I think the 'suite' must have been made sometime in the 1930s. I remember it from my childhood, covered in fern green and burgundy cut velour - kept for best in the front room. Later, my parents built a large living room and it was suitably recovered in yellow brocade. It was in this guise I eventually acquired the three pieces. They lived rather eccentrically with my mainly scrounged and Ikea furniture and survived my teenaged children. Some time ago I had them recovered in blue linen, which is now decidedly shabby. They've been part of my life for all of my life. My abiding love is garter stitch. I love its neatness, its predictability, its mathematical precision, its assertive simplicity. But from time to time a fling is refreshing, and I'm having a fling with Noro stripes. 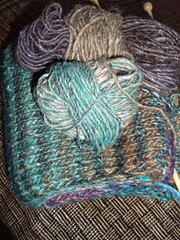 Actually, it's my second fling with Noro stripes - when you find something that gives you such pleasure, why not repeat it? 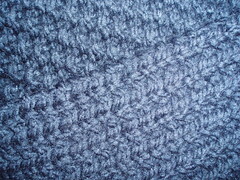 This is the generic scarf pattern as outlined by Brooklyn Tweed . 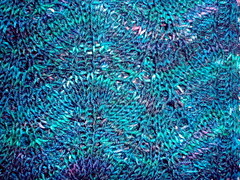 It's a one-stitch rib on an uneven number of stitches, with two row stripes knitted from two balls of Noro Silk Garden (or from the outside and centre of the same ball). The second yarn for making the stripes is cunningly carried along the side of the scarf, hidden through purlwise slipping of the first and last stitches on each second row. I love the way the stripes are unpredictable, sometimes quite contrasted, and at other times almost unnoticeable. 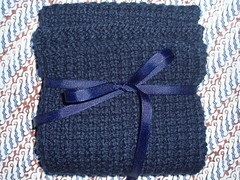 This scarf is for a good friend who has just been through a tough time. I'd like to finish it this weekend. My previous Noro fling resulted in a scarf for my daughter, which she wore constantly. So wonderful when a fling you've enjoyed also leads to pleasure for others.